When you decide to switch to solar, Sustainable Design can take care of every step, including engineering, financing, permits, installation and ongoing monitoring of your system performance. In addition to domestic hot water, solar can heat a home, pool or hot tub. 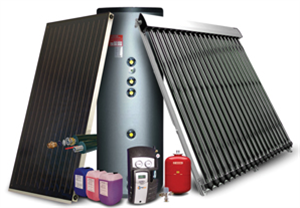 Solar heating beautifully supplements hydronic heating systems, such as radiant floors, radiant baseboards and panels. Hot water and space heating together account for close to half of an average home energy consumption. Solar hot water replaces that energy consumption with clean, free energy from the sun. Solar pool heating is the most economical method to heat your pool and extend the swim season. The versatile design of our pool system allows it to be installed in any region for indoor and outdoor use. Because we use a closed loop design, the system offers you the highest amount of durability and longevity. Our BPI-certified staff can not only help you obtain more affordable electricity from solar power, but we can also help you use energy more efficiently by performing full energy audits for homes and businesses.